There were different houses built with that foundation, which actually had to work with Mike Holmes' Make It Right, as he had trademarked that name first. Some houses in New Orleans are built on tall columns, for flooding occurrences. It is almost 4 years after Hurricane Katrina--not everyone has been able to come back. I can see the outlook of some people that have not come back, for they lost EVERYTHING with that mess. Loosing a home you had payed for, loosing all your furniture, to all appliences & just so much more that you felt to be personal. That is a maze of a loss. Some of those people have found a safer place to try & live in/on, to sort of try & start over again such as a job, to who knows. Some might be with some relatives to new friends to almost a different way of life from before & we can only hope the new way of life is to the good of them. Yet so many still have that nightmare in mind of total frustration as the time & even a bit after. Obviously I still have things in mind like the houses with posts to keep them above water. Sort of like some of the places in Africa. Now they look nice in the few photos, BUT what somes in mind where does one receive their WATER fo drinking, shower/bath, to washing things to washroom & such for obviously some bottled water is NOT the answer? What about sewage from their own washroom to kitchen? Basically I feel their homes previously had clean fresh water supplied to them through underground water lines & possible(??) the sewage went down the sewage line or possibly it was a septic tank with a drainage field!!!!!!!!!!! I am saying this from the fact that our fresh water comes from farthr up the hills due to the snow run-off to our resivours to presently a 2 million plus more dollars to a water purification plant ONLY it has failed all this year. SO we are back to boiling water, to also obtaining a number of ll Liter contains I have refilled at a safe place, or so I feel. As for the snower to cleaning my teeth, washing my face I CHANCE IT with the present water. Besides in brushing my teeth I use the dry toothbrush with some paste on it & only time the tooth brush touches the present present water is to clean if off at the last. Anyone have 1 Million Pounds for a houseboat? If so this may be just what your looking for. Location is everything and in this case it's worth 1 Million Pounds. 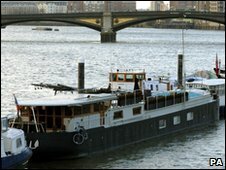 (bbcnews)The three-bedroom vessel is docked at Cadogan Pier, by the Albert Bridge in Chelsea, west London. The 1,388 sq ft boat, named Ocean, is thought to be the most expensive houseboat offered in London. Estate agent Ian Brownridge said: "People love it but they find it difficult to get their head around spending £1m on a boat." The price works out at about £720 per sq ft. That compares with a price tag of about £1,000 per sq ft for a flat in the vicinity. 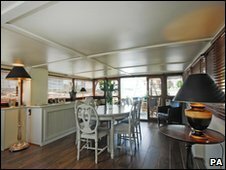 The boat has a kitchen and dining area, a reception room, a study and a utility room. It even has a small swimming pool on the 577 sq ft deck. The boat was purchased in France by its owners and sailed to the UK to the present mooring. Mr Brownridge claimed it was good value considering the location and added: "We have had quite a lot of interest in it." This bit about a houseboat sort of vessel does make me think of some of the small house-boats sold in the Kelowna area. Basically they are used as a sort of summer shack like a cabin, but then different in a way. Finally so many boating people to those with homes on the lake side-shores have been complaining due to them dumping everything in the water to some of the house-boats are more like delapicated shack & some are next to sinking though owner is not around. Not as elaberate as the vessel above, will be taken from the water space they have been in for some yrs & destroyed. Something else to give thought regarding the above. Also these above are definately not capible of standing any distance to go, to not being accepted in most parts of the Okanagan Valley lakes to high winds or such. True once in a while one will make it down to this part of the Valley, but the RCMP keep a close watch on them & they can only stay for a few days then go back to Kelowna. Hong Kong's so called "cage men" may be among the city's poorest, but rents per square foot for their dingy wire-mesh cubicles are now on a par with luxury flats in the city's famed Peak district. With Hong Kong's property prices having soared over the past year and urban redevelopment shrinking the supply of older, cheaper tenement blocks, thousands of cage men still dwelling in 15-square-foot cubicles, usually crammed eight to a room in rusty tiered bunks, have seen their lives squeezed even further. There are cage women in Hong Kong too. Wonder why that flashy city does not think social housing is a better idea. Cramming people into tight spaces--health issue, fast spread situation. For a society keen on family life, municipal staff need to extend family concept to cover those less fortunate so that all have shelter etc. There's the usual scurry round, the divesting of work accoutrements and snippets of talk about what the day has brought. The morning's coffee cups sit on the drainer as the evening meal is started. All in all another regular evening at home. The difference here is that Matthew and Rose don't walk to theirs via a pavement, but a towpath ending in a gangplank. They live on a boat. "The housing market was such a nightmare last year we didn't want to get involved - the length of time it takes to get anything done, the cost and the way it ties you down. So we went for a boat," says Matt. One day it will catch on big time and the price will skyrocket. It looks like a high-tech Slinky straight out of a sci-film. But Russian architect Alexander Remizov believes the prototype design he calls The Ark is the answer to dealing with climate change and natural disasters.The structure, or biosphere, is designed to withstand floods, earthquakes and tornadoes. It is made out of wood, steel, high-tech plastic, and solar panels, and could be used as housing or a hotel, said Remizov, who heads the Moscow-based architectural firm Remistudio. Interesting idea but I doubt it will catch on.